Thinkspace is proud to exhibit artist Terry Arena in the office area this upcoming Saturday. 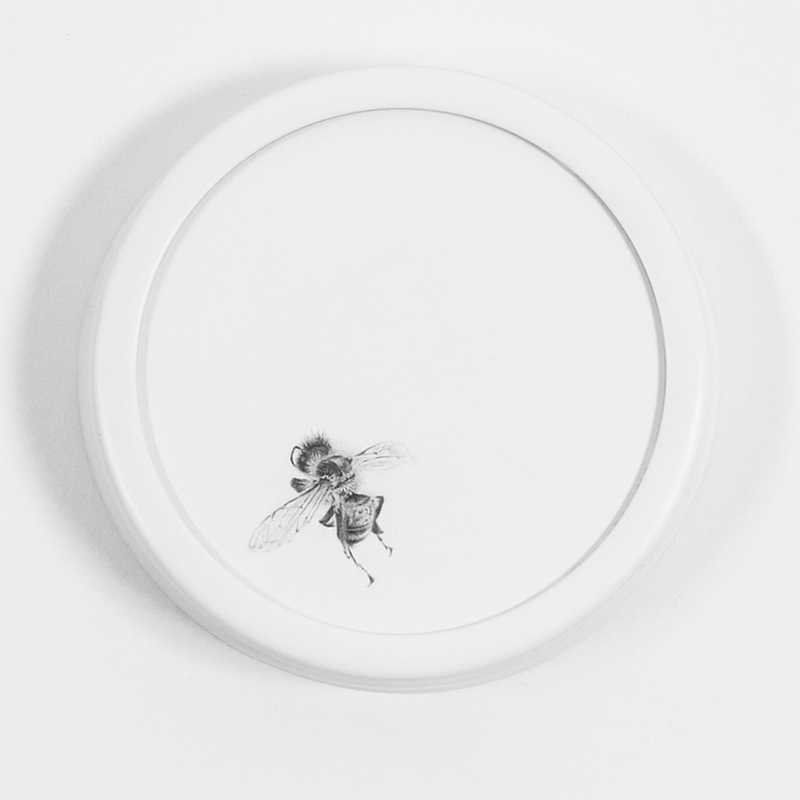 Terry Arena’s Swarm is a series of works of detailed and delicate renderings of bees in graphite on gessoed objects. In anticipation of Swarm, we have an exclusive interview with Terry Arena to discuss the inspiration behind her work and creative process. 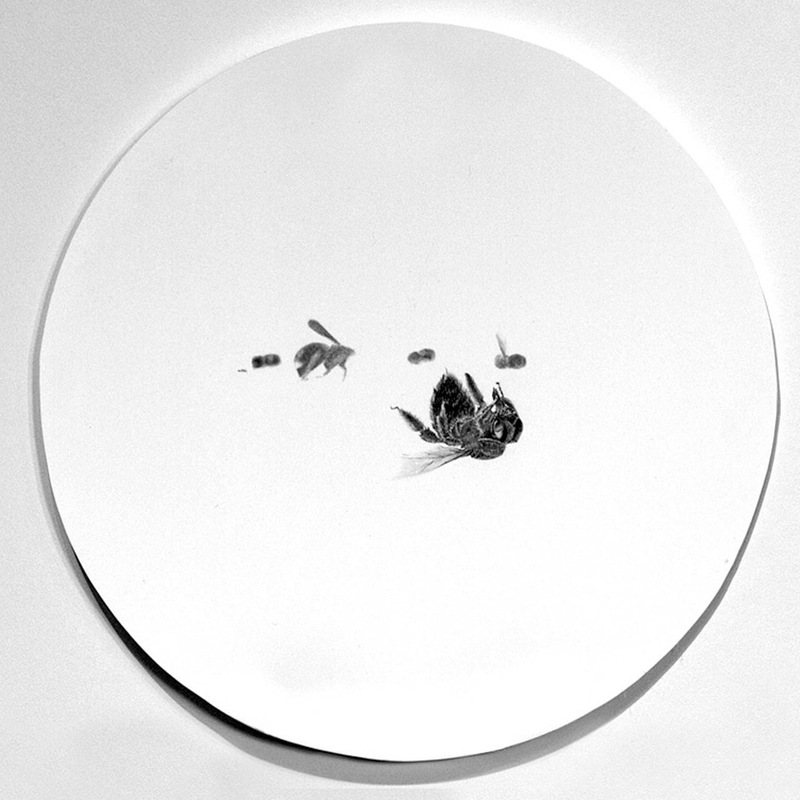 Swarm is on view Saturday, August 5th through August 26th. SH: What inspired Symbiotic Crisis? Was there a singular moment that triggered this decision to explore this topic in your body of work or did it slowly evolve? TA: I had been making work about food culture. Think homemade meal prep, processed food, gmo’s, organics, etc… One day I heard an interview on NPR that was discussing how bees were being transported across the country to pollinate various crops. The visual of hundreds of thousands of bees loaded onto an eighteen wheeler struck me as odd. 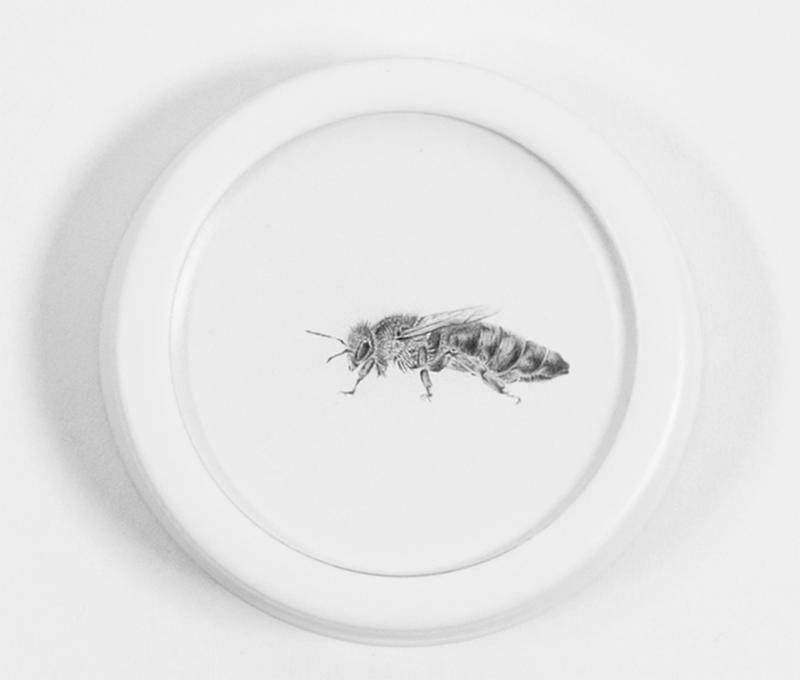 I had never really thought about the bees’ role in food propagation. It’s pretty critical when you consider bees participate in producing a large part of our food supply. 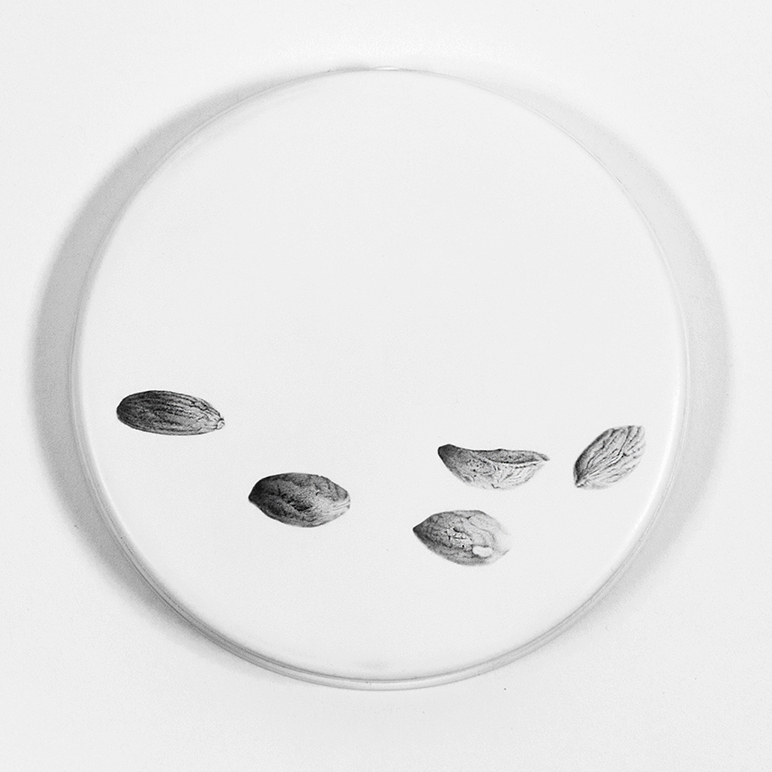 The almond industry alone is a billion-dollar industry and is reliant on pollination for its success. At that point, my focus shifted to bees and colony collapse disorder(CCD). SH: What do you love about working with graphite? And how has the medium helped to shape your work? TA: I love that it is an ordinary low tech material, yet has the ability to be very sophisticated. Originally, it came into the work because I felt it supported the notion of simple methodologies having worth. In my research of food culture and then CCD I kept finding that maybe the best solution to problems (proliferation of varroa mites for example) might be to step back and let the natural order of things occur (swarming in spring to break the varroa life cycle). And my work is analytical, so graphite just works in that regard. TA: It really depends on where I am in a project. For the Symbiotic Crisis (bee) pieces there is a lot of surface prep. I might spend time cruising thrift stores looking for cookie tins to draw on and then I get them home to clean, sand, and prime. After that, it’s many layers of gesso with sanding between each layer. While surfaces are curing I often go through my source materials or look around the garden for new subjects. I draw both from life and photo references, so I have a pretty good collection of dead things in my freezer. It’s a little odd, but my family and friends know about my work and are always saving me dead bees, interesting bugs, and birds… I have four dead birds in the freezer. They are beautiful. Once surfaces are ready, I pose my subjects in a set and take lots of photographs with various lighting. Then it’s a line drawing followed by hours of rendering under a magnifying lamp. This year my goal was to complete 100 drawings in for the series. They are all essentially done, but I have a handful that I am still editing. There is always something to do in the studio either for my current work or projects I am planning for the future. SH: What is your favorite fruit and/or vegetable? TA: I would be very happy eating an avocado every day…maybe even two! SH: Your work in the past was inspired by the Slow Food movement. Do you find exploring these ideas and circumstances the world finds itself in within your work a form of analyzation or is it more of a catharsis? The work giving you a voice in the greater conversation. TA: I must admit that I really enjoy the research from studying my subjects under the magnifying lens to learning about pesticide use. I also think I just want to feed my family delicious healthy food that will not cause harm over time. Maybe it’s a leave no trace theory…no extensive trace (I am realistic) of strange chemicals in our bodies or the environment. I want to be a part of the conversation of protecting the bees and providing better food systems. It takes a collective consciousness to make big changes socially and this subject resonates for me. SH: What inspires you and draws you to other artists’ work? TA: I’m a sucker for craft and wonderment. It’s a thrill and wholly satisfying when work can evoke joy or challenge you to consider ideas much greater than yourself. SH: What do you listen to while drawing; podcasts, Netflix, music? What should we check out? TA: I’m definitely in an information phase right now. I try to keep up with the world by listening to NPR and then lighten up with the comedic takes of Stephen Colbert and Trevor Noah. I often slip down the rabbit hole of Youtube and have found great interviews and documentaries on Rachel Carson of Silent Spring, Noam Chomsky for his views on just about anything, and a little Elon Musk cause rocket ship rides to Mars and 3D underground transport are pretty fascinating! SH: If your work inspired a cocktail, what would be the recipe and what would it taste like? TA: I’m more of a whiskey on the rocks gal, but at Campfire in Carlsbad they make amazing drinks that are so beautiful and tasty I would love to have provided inspiration for one of their creations. A real beauty with a kick is their “Roasted Beet”. The flavor is bright with a bit of spice. Think gin, ginger, honey, lemon and thyme with a vibrant magenta color. 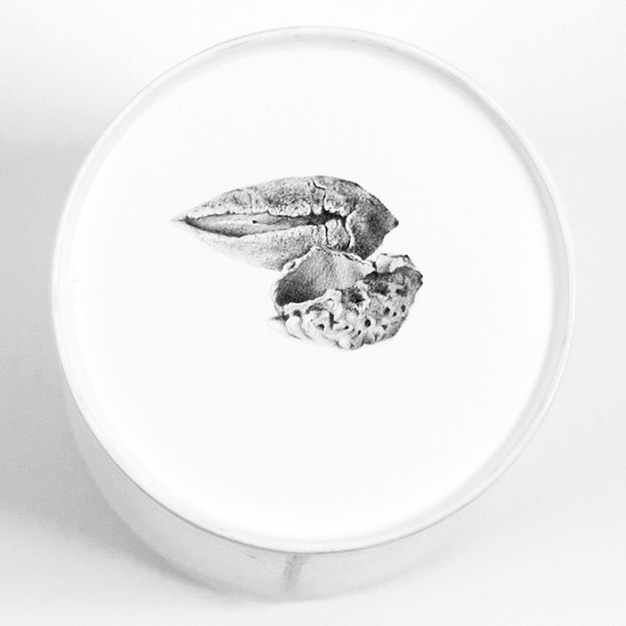 Next Saturday, Japanese artist Ozabu will be exhibiting her latest body of work at Thinkspace Gallery in the project room. 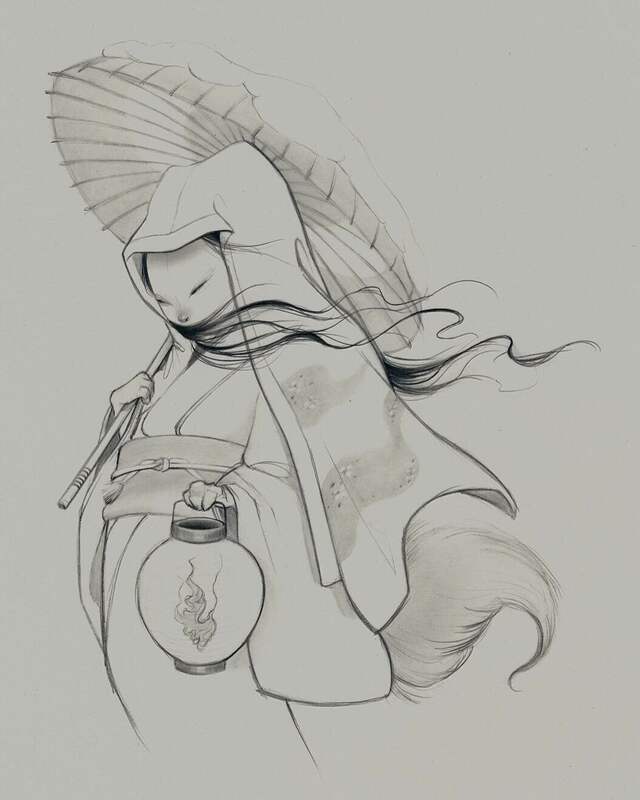 Ozabu’s graphite drawings are highly rendered with subtle line work leaving a weightless ghost on the paper. 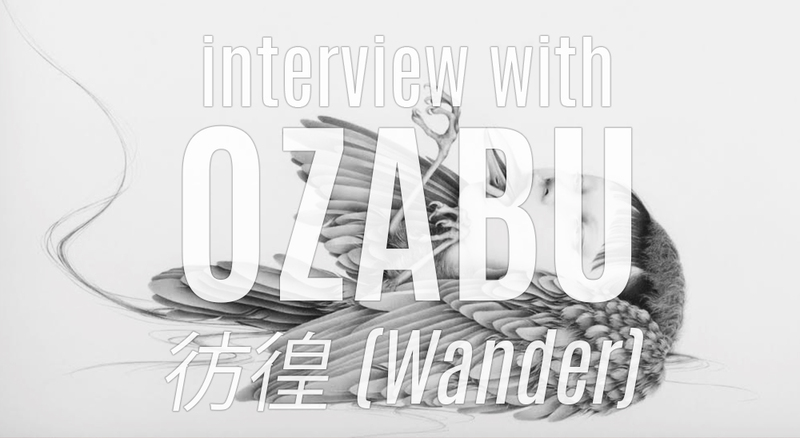 Our interview with Ozabu for 彷徨 (Wander) is slightly edited to compensate for the language barrier but gives insight into her self-taught discipline and if she drinks coffee or tea. SH: As a self-taught artist, what motivated you to pursue a life in the arts and what books or techniques did you study to develop your own artistic style? OZ: My parents are a big influence and introduce me to art. They like drawing and love art, so we’d often go to museums and draw together at the park when I was a child. But as I grew older, I became less interested in drawing. Then about 5 years ago, I suddenly was inspired to try drawing again and realized I did not have the skill to draw as I wish I could. So, I decided to start again from that point on. I’m attracted to the profundity express in graphite and now here I am. I didn’t use any reference books to learn drawing. I’ve never researched what kind of techniques or tools other artist use. I would just see a piece in person and then analyze it, teaching myself the technique and trying out different tools until I understand how the piece was created myself. SH: What is the inspiration or theme behind this latest body of work? OZ: I’ve always pulled inspiration from the things that I’ve felt and my experience with a bit of Japanese extract. I experienced the death of an important person in my life around the time I started working on this show. So the pieces in the exhibition include funeral and parting scenes. I felt that the more I drew, that dark place within myself is what was brought up when drawing those pieces. 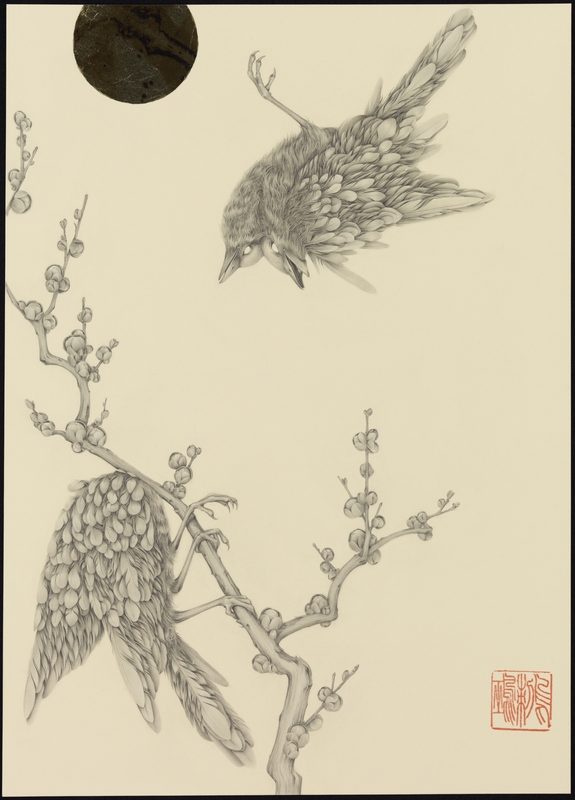 SH: Many of your pieces involve birds or feathers the elements adding movement and dimension to the work. Are the birds and feathers also symbolic? OZ: Yes. They possess something that I don’t have. I don’t know why, but they’ve always fascinated me very much. SH: What are your favorite tools to work with? SH: What is a common mistake people make with drawing? OZ: That they don’t put their emotions into the drawing. SH: When not working on art, what captures your attention and takes up your time? SH: Are you a coffee or tea drinker? SH: Who are a few of your favorite artists right now? 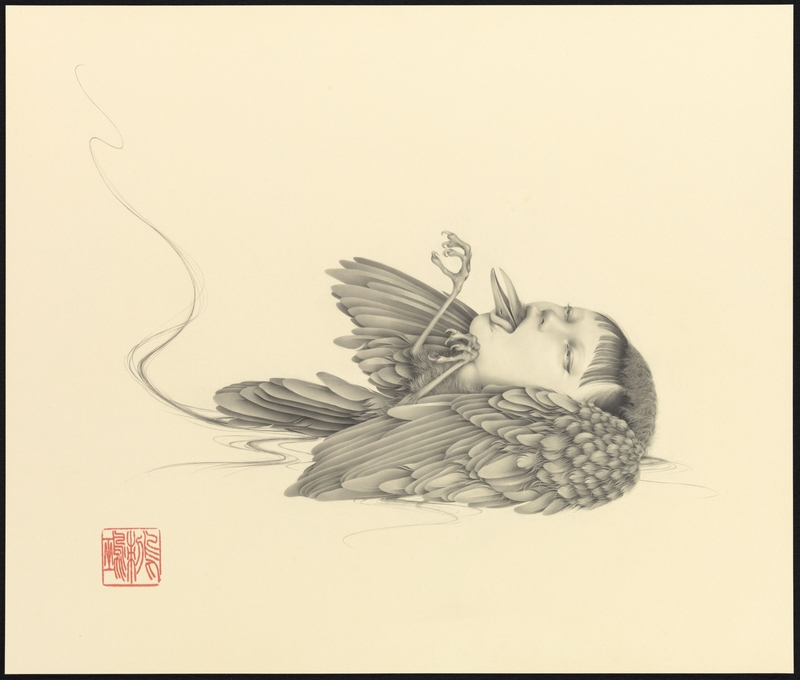 OZ: Esao Andrews,Dan Quintana,Ito Jakuchu,James Jean,Jessica Joslin,Katsuya Terada, Kikyz1313, Kent Williams ,Gakkin, Fuyuko Matsui, Vania Zouravliov and more! SH: Are you left or right handed? The opening reception of Obazu’s 彷徨 (Wander) is Saturday, September 17th from 6pm to 9pm. Please visit the Thinkspace Gallery website for more information.